MacDailyNews reader “Boomer” just sent us an email and a link to a video he just uploaded to YouTube. Boomer writes: Hi MDN, I think I found a little gem on my hard disk today: Steve Jobs’ rebuttal of Michael Dell’s historic SIDAGTMBTTS (“Shut it down and give the money back to the shareholders”). I could not find the footage anywhere else on the web so it guess it hasn’t been seen for about 16 years. MacDailyNews Note: Some iOS device users report garbled audio. Works on Mac. Try the other videos/video links below if using an iOS device. MacDailyNews Take: Finally, the targeted Michael Dell imagery has been found! We haven’t seen this since we saw it live in 1997! Thanks, Boomer, Torsten Alisch, and Guillaume Gete! 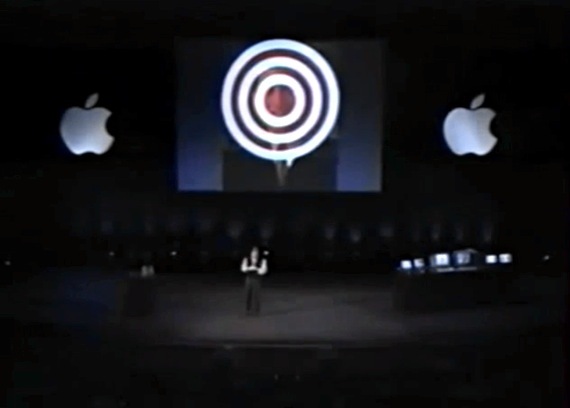 I clearly remember when Jobs painted the target on Dell’s face in that keynote. Boomer – Please post the entire presentation!! So, after Mr. Dell had to SIDAGTMBTTS, I bet he wished he never said it an hoped the SIDAGTMBTTS would disappear. The should start each of the quarterly reports with video of these idiots comments. Like Ballmer’s about the iPhone not having buttons. No vision, imagination or class! I see the watch comments now. F%@king GREAT. Couldn’t help laughing. Man I miss Steve. He was a genius showman. Amazing how he could make anything happen once he put his mind to it. I like Tim Cook, but heis no Steve Jobs. Truly a unique person, impossible to replicate. 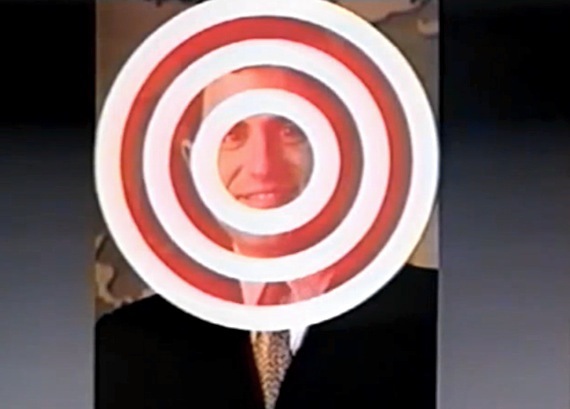 Excellent to finally see the Bulls eye on Mikey’s face. I’ve read about it so many times. This is the first time Ive seen it. I loved it! Go Apple. Great job Steve.